Preheat oven to 375°F. Grease two 6-oz ramekins with olive oil and dust with sugar. In double boiler, melt chocolate, 1/2 tbsp olive oil and cream; let cool. Meanwhile, using electric mixer, beat egg whites until soft peaks form. Whisk egg yolks into cooled chocolate mixture; fold in egg whites, 1/4 cup sugar and cream of tartar. 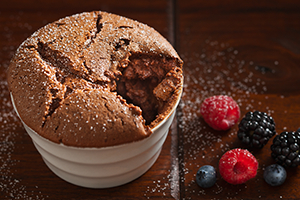 Pour into prepared ramekins; bake for 15 minutes. • This recipe is easily doubled. • Garnish with fresh berries if desired.